This entry was posted in Baking, Daily Blog, Desserts, Recipes and tagged Apple Cinnamon Roly Poly, Apple Roly Poly, Baking, Dessert, Food, Pudding, Recipe, Roly Poly, The Complete Cook Book by thecompletebook. Bookmark the permalink. I’ve never heard of, nor tasted, a roly poly, Mandy, but I sure wish I had! It sound delicious! As much as I love apples and cinnamon, I doubt that I would ever try it with anything else & I cannot wait to have my very own roly poly baking in the oven, Thanks! love the rolly polly idea! So simple and neat yet utterly divine! YUM! Yummy. Enjoy your new camera, I am green with envy. What a great dish! And name. i think you did a wonderful job taking this photo with your real camera :). 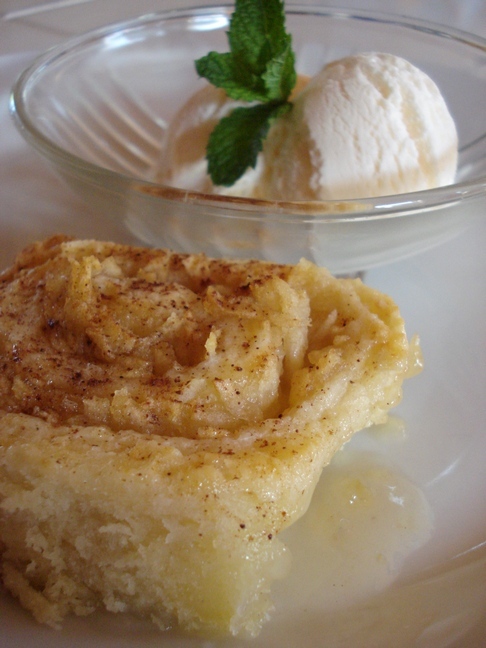 And this apple cinnamon roly poly looks so decadent and delicious. I have one question: Does Roly Poly make one a Roly Poly? Because it looks toooo good…. Looks great even being shot with your “Toy” camera…even without the raisins. Beautiful photo and yummy recipe!!! I had to admit that only roly poly I know is the bug (here goes my baking knowledge!). I didn’t even know the English name of this until my son told me. Thanks for introducing this delicious recipe! Happy B-day to your dad! How’s your new camera? Hope you are having fun with it! Roly poly…I didn’t know the cinnamon rolls without raisins are called ‘roly poly’…what a fun name. I love roly poly. It is such a comforting dessert. And perfect served with ice cream. It looks so cute, delicious and simple! ^^ I should make this for someone’s birthday soon! I can’t imagine why on earth it would be called Roly Poly (?!!) ;). But seriously, this looks like a mighty delicious dessert – worthy of a dad’s birthday! Hope it was a great celebration. Mandy – I’ve never heard of roly poly but it sounds wonderful! Served warm, with ice cream. Yes – I’m all in! PS. I really hope you are getting my emails about the comments problem on your site. Mmm, I love cinnamon, and these do look especially good served warm! Thanks for the recipe. I’ve never heard of this cute named treat!!! Sounds very good! Happy (belated) birthday to your dad!! How wonderful it was that you could share it with him! This looks pretty amazing! Soft and chewy! mmmm!! I’d love this for breakfast! I never heard of a roly poly before I love the cute name.